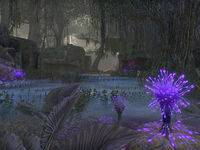 The terrain of Deepmire is largely swampy, containing various typical Murkmire flora and creatures such as behemoths, bog blights, voriplasms, and wamasu. Many large animal skeletons, possibly belonging to swamp leviathans, can be found deep within the mire. Several xanmeers of varying condition can be found in Deepmire, likely from the pre-Duskfall era. Historically, there is more to Deepmire than a hostile and unfriendly terrain to be avoided at all cost. At some point in time, it was known to have been used by the local tribes for hunting, for example as part of their chukka-sei, an Argonian coming of age ritual. Judging from the nearby xanmeers such as the ruins of Xul-Thuxis, Deepmire seems to have been inhabited by the local tribes during the time before the Duskfall event, when priests of Sithis used to reign as kings. This theory was lent further credence in 2E 583, when the Soulless One spoke to one of the few Argonians inhabiting Deepmire, who claimed that the region is meant to be a refuge for the Murkmire Argonian tribes during times of need. Called "the Refuge", the area was not supposed to be visited lest to take shelter, inhabited only by those who tended to the place. The eastern side of Deepmire is home to an ancient Argonian tribe called the Root-Whisper Tribe. Some time during the Barsaebic Ayleid invasions of Black Marsh, the Root-Whisper Village came under attack by the Ayleids. Led by battlemage Myndhal, the Ayleid forces were so numerous that the defending tribe, led by Raj-Kaal Druxith, was unable to hold back against the enemy waves. As a last resort, the tribe's sap speaker and the remaining members of her sacred clutch retreated to the caverns deep beneath their Hist tree and created the Remnant of Argon, a relic which would contain the souls of all the remaining villagers. By doing this, the life energy of the Hist tree was almost completely consumed, leaving the tree more or less lifeless on the outside. In 2E 583, an archaeological group named Cyrodilic Collections pursued the Remnant with the aid of the Soulless One. Accompanied by two Argonian champions of the local tribes, the Soulless One entered and traveled through Deepmire. By that time, Deepmire was inhabited by dangerous swamp creatures, hostile Blackguard raiders, and the undead. The adventurers managed to find their way to the ruins of Root-Whisper Village by traversing the Deepmire and passing through Xul-Thuxis, which has an entrance deep in the mire. Having successfully recovered the Remnant shortly thereafter, the Root-Whisper Tribe was re-established. A picturesque underwater xanmeer, once owned by an Argonian water mage. An ancient village inhabited by the native Root-Whisper tribe. Also called "Snake-Means-Death City", an old Argonian settlement and one of the twin xanmeers tied to Root-Whisper Village. Also known as "The Bowl of Sun", the second of the twin xanmeers connected to Root-Whisper Village. This page was last modified on 6 February 2019, at 09:50.